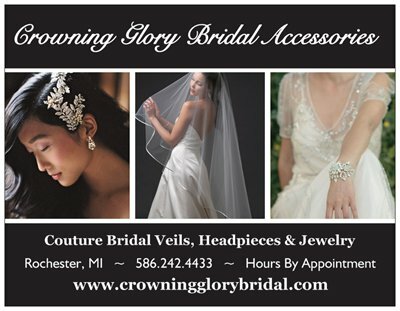 Crowning Glory is our cozyTea Room​ style boutique featuring an award winning collection of couture bridal veils, headpieces and jewelry that brides have been falling in love with for over 15 years. We're thrilled to offer the "Bespoke"​ option to our lovely brides. Bring a special piece of jewelry that has sentimental meaning and we will incorporate it into the headpiece, necklace or bracelet creating a one of a kind design and cherished family heirloom. Hours are by appointment for an enjoyable personal experience. We are honored to be the recipient of the Rochester's Best Bridal Salon Award and Rochester's Business Hall of Fame Award 2013 -2015.